The Peopleâ€™s Democratic Party (PDP) in Lagos has urged the Independent National Electoral Commission (INEC) to ban the All Progressives Congress (APC), from participating in the forthcoming elections in the state, accusing the party of militarising the polity, recruiting thugs and notorious criminals into its fold as members. 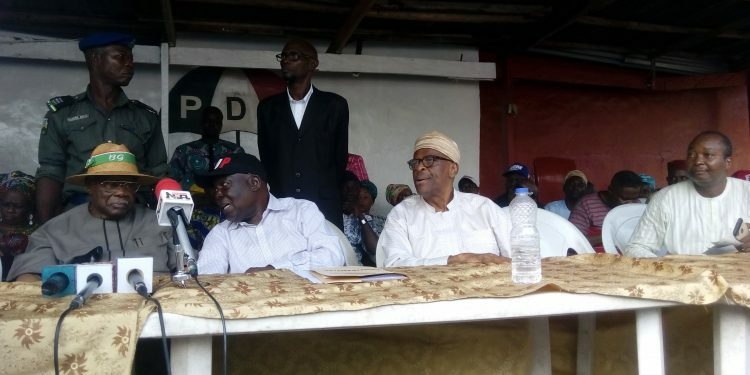 Addressing the general assembly of PDP at the partyâ€™s secretariat on Thursday, which also had in attendance the former Deputy National Chairman of PDP, Chief Olabode George, the partyâ€™s Publicity Secretary, Mr Taofik Gani, Chairman of the party, Dr. Adegbola Dominic, stated that the APC members were now brazenly perpetrating assault, crime and killing without any arrest. â€œWe state strongly that the APC, especially should be banned from participating in the forthcoming elections because of how the party has now militarised the polity. â€œThe recent undeniable assault, hardship foisted on Lagosians, following the so-called APC mega rally is still fresh on our minds. These violent APC members boldly used dangerous weapons like machetes, guns, knives freely even as the APC governor was present and reading his speech. â€œWhilst many were injured, at least three persons have been announced dead from the APC fracas. Many innocent, non-partisan Lagosians also lost their valuables. Lagos was held hostage. â€œWe cannot over look this as we know that the APC has a violent group â€œFace of Lagos,â€ with daring and notorious killers prepared to silent the opposition in the state. â€œThey are already planning attacks on our members, candidates and chieftains across the state. â€œWe have not and cannot forget the gruesome murder of our governorship candidate in 2007, Engr. Funsho Williams. We therefore call on INEC to activate its powers to disqualify the APC for this obvious, monumental electoral malpractice and violence. PDP charged the law-enforcement officers to provide adequate security to its members and all Lagosians. The party also kicked against the alleged agreement signed between INEC and the state chapter of NURTW, in respect to transportation and delivery of election materials before, during and after the polls. The PDP said it condemns and rejects in totality, the announced agreement, adding that its condemnation and rejection was hinged on â€œthe admission and confession by the Lagos APC Spokesman, Joe Igbokwe, that officers and members of the NURTW are card carrying members of the APC. â€œThere are viral videos and pictures confirming notorious NURTW officers and membersâ€™ support for the APC at elections held in Ekiti, Osun and Kwara states. â€œSimilarly, there is an open relationship between national leader of APC, Ahmed Tinubu and NURTW officers. â€œConsequently, we declare that the NURTW in Lagos State cannot be fair in the distribution and delivery of election materials to all voting centres, especially where PDP voters dominate. â€œWe demand that INEC should terminate the agreement in Lagos State and seek collaboration elsewhere.